Nail polish and nail art are so much more popular now compared to when I first started this addicting hobby four years ago; moreover, it seems like there are new nail blogs appearing everyday! 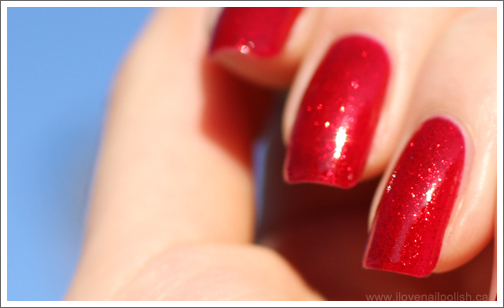 Do you have a nail blog or know of any good ones worth following? Please drop me a link to your recommendations or even all of your favourite blogs in the comments section, I'd love to know about them! Thanks in advance and I look forward to reading them! Hi guys, I just wanted to say hi and give you guys a lil update on what I've been up to for the past few months. Back in December, I finished my undergraduate studies after a mentally draining final semester. I was literally staying up working on my endless papers every night and lived off of caffeinated drinks. I'm really thankful to have supportive friends and family who kept me sane along the way. Proofreading, dessert runs, and late night snacks ftw! 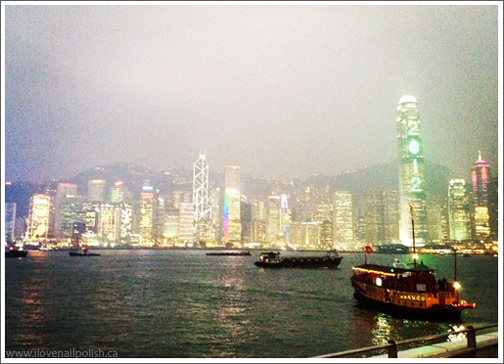 Afterwards, I went to Hong Kong, stayed for a month and spent the winter holidays there with my family. When I returned to Vancouver, I wanted to do all the things that I didn't have a chance to do before due to my hectic schedule. Therefore, I picked up baking and cooking and tried all the recipes that I've been dying to test out for the longest time. 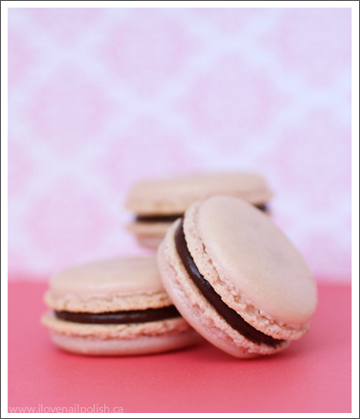 Above is a picture of some raspberry ganache filled macarons that I made. :) The cute, pastel coloured pastries have always been my favourite treat ever since I first encountered them in Paris when I was young. Learning that it is possible to make quality macarons at home really inspired me to pursue my dreams and have my very own French bakery someday. 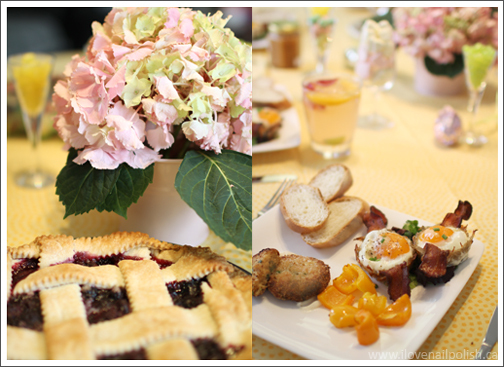 My latest kitchen adventure was an Easter brunch that I cooked for my family a couple weeks ago. I was super excited yet nervous because it was my first time cooking for such a large crowd. 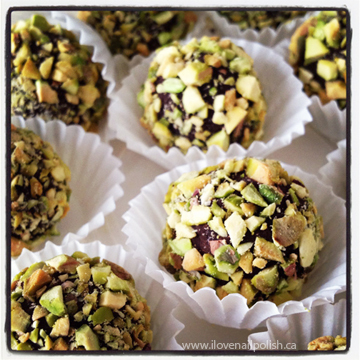 I made sure to use five starred, foolproof recipes and read all the reviews there were so I won't disappoint. All in all, I'd have to say it was quite a successful experience except for the fact that I was *slightly* behind schedule and turned my kitchen into complete chaos afterwards heheh. Thanks for coping with the supposedly brunch turned linner guys! That's all for now, have a great weekend everyone! 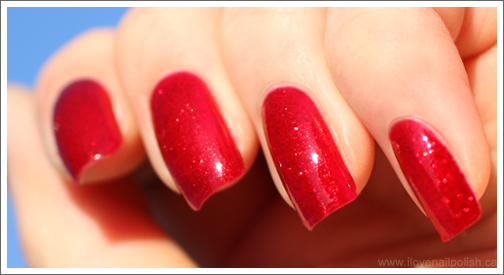 This beauty has been left untried in my helmer for years, but as one of the most popular red nail polishes of all time, Ruby Pumps certainly does not disappoint! It's absolutely gorgeous and my photos do not do this polish justice. You really need to have it on your nails to appreciate how beautiful it truly is! 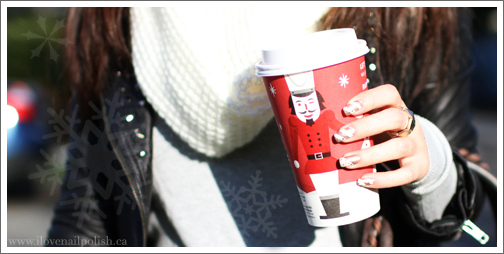 This is the first holiday nail art design that I have created for this year. All the nails except for the accent finger features diagonal stripes painted with gold and white polish, which I find a lot more unique and interesting than the usual holiday colour combination of red and white. 1. After applying base coat, paint your nail with a gold nail polish. I used a franken I created with OPI Glitzerland and Designer...De Better because I wasn't able to locate a warm golden polish in my stash. 2. 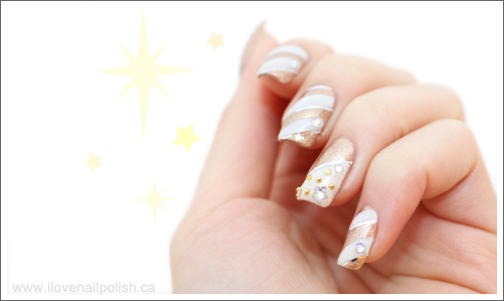 Next, paint a diagonal section on the upper portion of your nail using white polish. I used Essie Marshmallow for this design. 3. 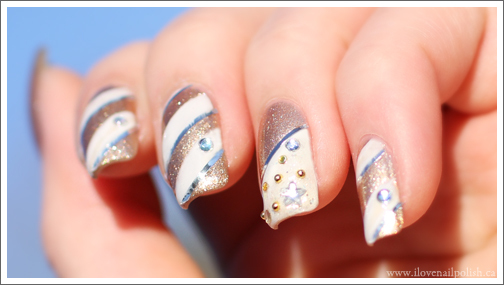 Line the edge where the two colours meet with silver nail art tape. 4. Glue on your favourite rhinestones and nail decals and finish the design with a thick layer of top coat to protect your mani. I hope you like this design ladies and I'd love to know what your favourite holiday drink is at Starbucks!